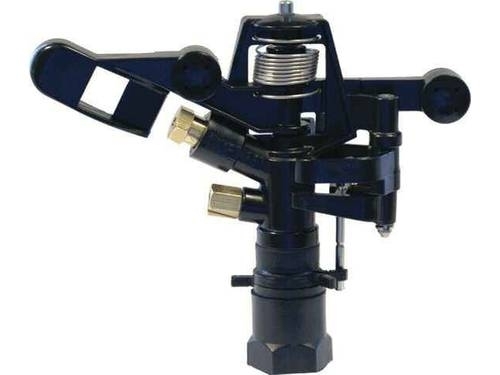 • Part circle impact sprinkler, medium flow. • 3/4” male or female connection. • Arm with 2 steel weights inserted. • Nozzle angles of 30º and 11º. easy and quick to adjust. the side and corner areas. and an optimal coverage coefficient. • Reach: 12 - 19 m.
• Flow: 800 - 3,270 l/h. • Working pressure: 1.75 - 5 bar. • Area: Part or full circle. • Trajectory angles: 30º and 11º. • Maximum stream height: 4,0 m.
the rotation will be constant and continuous. leguminous plants and fruit trees. • Units per box: 50. • Threads in BSP or NPT under demand. • Plate with diffuser pin for the main jet. • Foldable tripod for mobile installation.